In e-commerce world the famous line ‘Money makes the world go round’ would probably sound like ‘Good design makes trade go round’. And no wonder, since quality design usually makes for lion’s share of success for any e-shop, be it lingerie boutique or accessory emporium for punks and goths. Landing page or storefront is more than a business card, it’s the attention grabber. Will client stay, will he have a good time looking around and (punchline) will he spend money and come back to spend some more, it all depends on how you store looks. Visual doesn’t exactly trump content, but in many ways it is a decision-maker. We estimate that more than 80% of all e-commerce sites use themes in their design. Which makes a ton of sense: why reinvent the wheel, if you can use ready-made templates which are made by pros. Moreover, in most stores the layout is pretty standard and familiar for everyone: ‘about us’, ‘contact us’, ‘catalog’, etc. And most shoppers like it that way and would frown at something different, since not many people are willing to spend time familiarizing themselves with not-so-obvious interface while shopping. Having a ‘looker’ website also plays key role in marketing and increasing sales. It can act as a tool for establishing credibility and building brand recognition. And the only way to make the most of your website is to create an attractive page which would instantly capture the attention of visitors and won’t let go. As an entrepreneur, you must pick the appropriate theme that will efficiently do everything for you from promoting your products to boosting sales. Most starting e-merchants, dreaming of gorgeous storefronts with lots of special effects, go to marketplace place and… instantly feel overwhelmed with the vast choice of expensive themes and plug-ins. Each theme looks sweeter than the previous one, but the prices might give you pause if you’re on a tight budget. True, effective web design can get pricey, but for small business owners or newcomers on e-commerce markets, there’s no need to wait until your company can afford hiring famous graphic designers. 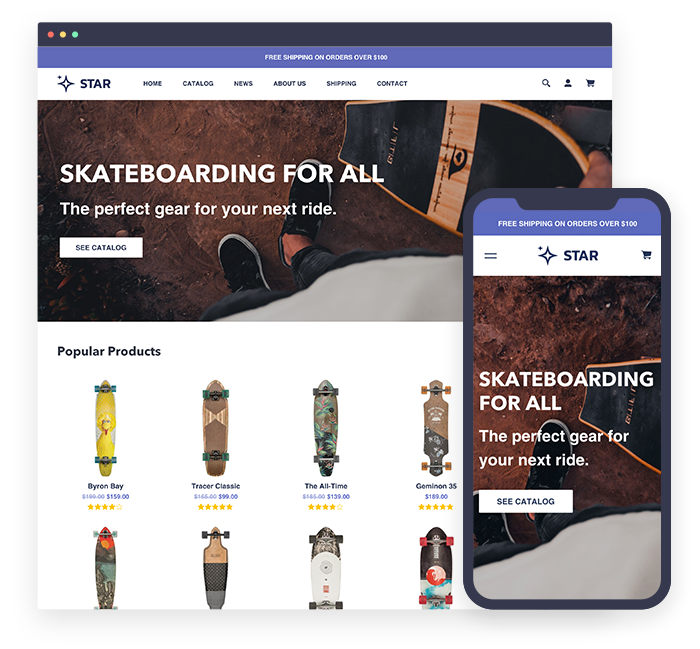 As a budget-friendly alternative, we invented Star, affordable Shopify theme, specially built for online business owners. For your storefront Star is the perfect choice. 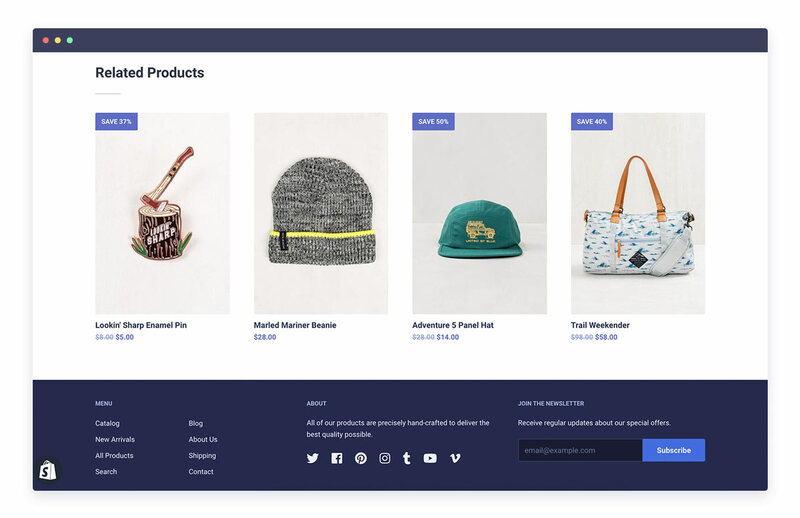 Few other Shopify themes can match its quality, given that it includes a lot of necessary modern features. In the e-commerce world the attention spans are infamously tiny and the first impression MUST be stunning. However, to stun the majority of potential shoppers is a mighty task, since some people like laconic and efficient outlook, while other appreciate enchanting visuals. 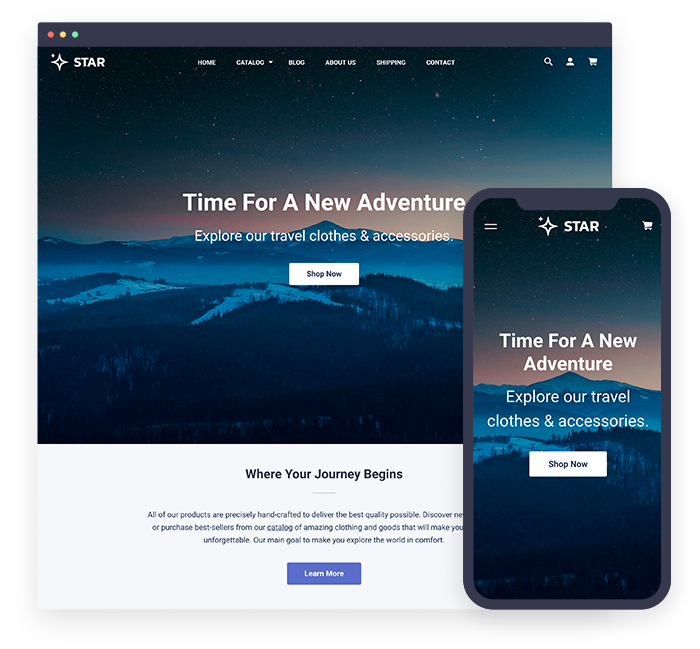 Star has two styles, ‘Polaris’ and ‘Sirius’, which cater to both types, with one boasting easy on the eyes, gorgeous mountain landscape and less picturesque and other, more business-like, announcing straight on what you’re offering. Page creation and customization are easy and intuitive, so there’s no need to be guru in coding. Install and setup can be done in couple of minutes, and only you can decide how much time will be spent on beautifying. 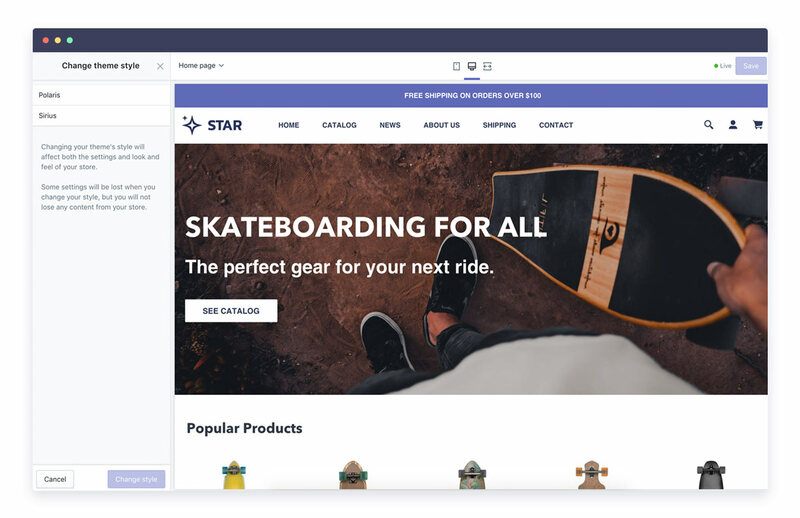 Star offers enough tools for make the result good-looking enough to make newcomers in e-commerce worthy rivals of seasoned veterans. Every design element can be selected and customized with ease, so just choose the ones that best serve your company and adjust the theme settings as you deem fit. And make it as pretty as you like with the help of color and image swatches and parallax effects. Keeping the layout on your site simple and clear will make both clients and visitors happy and coming back again and again. Navigation should be helpful and clear, assisting the users in finding all the needed info which is what you’ll get if you choose Star for your shop. It features ‘Related products’ option, allowing you to increase sales instantly by displaying products similar to shopper choices on the product pages. Three-level dropdown menus let save much needed space on a page and make for a shopper-convenient structure. Product tags and filters can be invaluable tools which can optimize the architecture and facilitate searches. 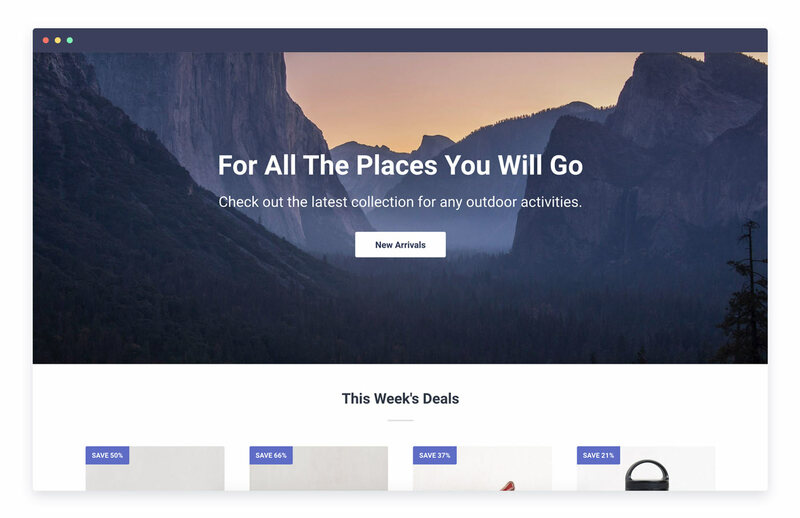 With homepage sections you’ll be able to present your products ultra-efficiently. Each element of the page must satisfy three key criteria: aesthetics, function and usability. In Star, the most important of all elements, the shopping cart, scores high on all three metrics. Unlike other themes, where static shopping cart is simply placed somewhere in the corner, here you have pretty dynamic cart. 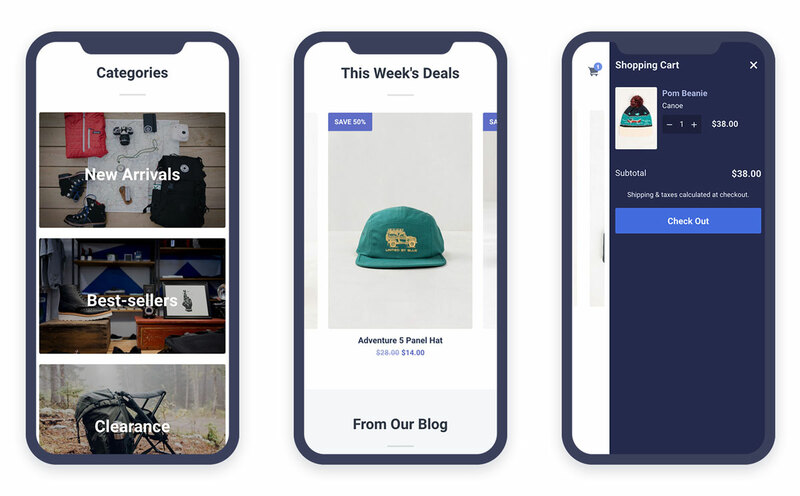 Chances that your customers will be abandoning their carts are close to non-existent, since slide-out design will allow shoppers to use it without leaving the current page. And keeping the client on the product page instead of sending him to a separate cart page is a dominant web-design trend in 2018, so in this regard your store will be on par with e-commerce leaders. As a number of mobile-only shoppers increases every day, it’s very important to remember that your customers will be using many different devices with various screen sizes. Responsive design is one of the must-haves for any store, since it automatically scales a site’s appearance up or down to match the screen size on which it is displayed. Today it’s already a standard for e-commerce due to Google considering a site’s mobile-friendliness a decisive factor when placing ranks in search results. Star boasts mobile-first design and thus ensures responsiveness and good rankings. Star optimizes and utilizes every possible resource to make your site a perfect place to shop. Google Rich Snippet will make the link to your store more informative, while the search results will be more relevant. Thanks to the optimization of Star for the search engines, your shoppers will have a better luck of finding you when searching the Internet for needed products. In this theme you’ll be able to get fast-loading AND fantastic-looking products pictures thanks to large images optimization. Use highest-resolution photos you have, and don’t worry about impatient shoppers who might leave. With the appearance of the Internet, people started seeing the online world as an ideal place for working, shopping, educating and, of course, socializing. Facebook, Twitter and Instagram now boast billions of users and it just wouldn’t do to leave such a mass of potential customers unattended. 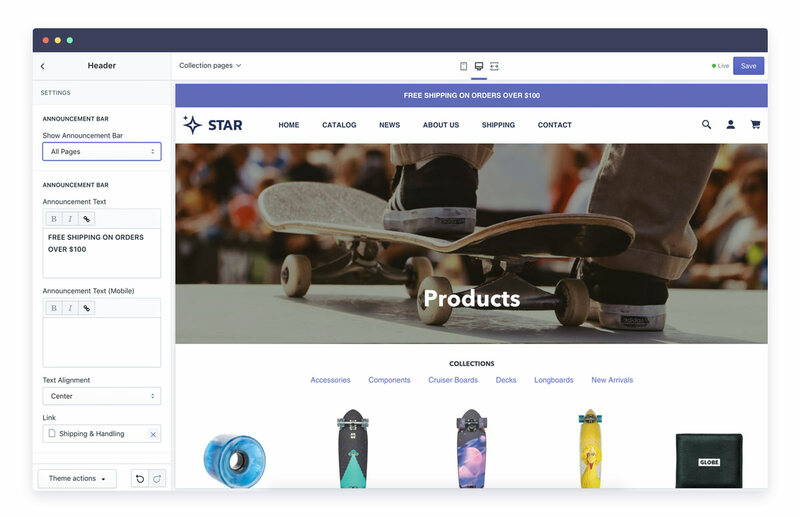 In Star you’ll find ‘Social links’ and ‘Share’ buttons which you can use to promote your store and reel in maybe not billions users, but decent increase in subscriber base is a given. An announcement bar is a neat way to draw attention to any offer that you consider important at the moment, from free shipping offer, discount or sale. And in Star you can forget about installing an additional app with a monthly fee, because it already has this feature. Support of vast choice of Shopify fonts library opens for you the doors to making the most of various combination of text styles. And last but not the least, you can use Google Maps to point out to your customers the exact location of your store and the most convenient route. That’s not all goodies Star offers, only the worthiest of mentioning in our opinion. So, did you click ‘Download’ button already? Yeah, we thought so. Star will let you create store with a distinct personality, so you can forget fretting about duplicated sites. This theme is set up and ready to go and won’t force you to deal with the hassles of designing a quality site. It has all the functionality you would want in a website, making it a viable option for entrepreneurs with a flair for making the most of the visuals on their pages. It offers many opportunities for displaying product photos, from encouraging readability with plain background to playing with special tools and effects. Its two styles with minimalist aesthetic and stunning scenery visuals possess a modern feel that would suit any kind of shop, from contemporary to vintage. And it’s totally, absolutely free, so use it to make your first store mobile-friendly, popular and attractive.